Non-indigenous knowledge of Aboriginal culture is notoriously poor in Australia, worsened in recent years by the former Abbott Government attempts to cut back Indigenous curriculum content for schools. Aboriginal artists carry much of the weight of responsibility for conveying to other Australians the spirit and complexities of their cultures. 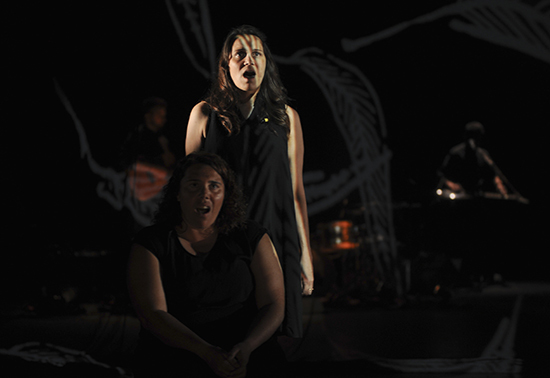 In August, Sydney-siders saw Winyanboga Yurringa; written and directed by Andrea James, it focused on a group of women brought together by an elder around ritual and cultural artefacts. Now, another fine production, of a very different kind, also tells of the significance of objects so often locked in museums. 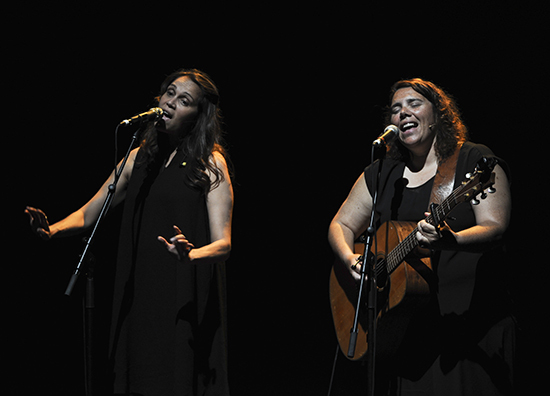 Popular Indigenous band Stiff Gins, Nardi Simpson and Kaleena Briggs, have celebrated their 17th anniversary with the premiere of an ambitious theatrical production, The Spirit of Things: The Sound of Objects. The singers open with “a happy song” in language, but interrupt it midway, declaring “this is a show,” not a concert, proceeding to take us with them into some very dark places, albeit with passion and humour and, at times, apparently perverse delight. On a visit to a museum archive the pair had seen objects taken from Aboriginal people and sites that hey felt should have been “rotting or burning” or, better, “at home.” These artefacts “spoke to them,” so the singers decided to choose eight and “sing them into being,” accompanying each song with a story and projection. A large transparent curtain hangs the width of the stage, a screen for ghostly images of feathers, leaves, water and stars, spilling wide across the floor. Through the scrim we see a guitarist, bassist and two drummers who play evocative arrangements with clarity and subtlety, if conversely, and unnervingly, amplified stadium-force, reducing the intelligibility of the singers’ lyrics. A crackling old wax cylinder recording prompts the artists to make their own version of the song they hear. It’s about a good woman who dies, decays into bones and sludge, then sprouts feathers (as abstracted ones float across the screen) and becomes a bird, singing to her loved ones. The singers tell her, “You are never dead.” Less hopeful is a story about a girl who becomes a victim of relentless racial abuse until she adopts “a mask” to defend herself from the world. Even more painful is a tale full of dark ironies. A good relationship with a local white farmer secures goat’s milk for a mother whose children she fears are the targets of child-stealing government officers. She expertly trains her offspring to watch for such men and in ways of escape. However, made drowsy by their loving mother’s honey sandwiches, the boys, high in a redgum, fail to see the arrival of the officers. The mother takes fright, surrenders the girls to the river, where they drown, and witnesses her sons trapped in the tree. The singer completes her song with deeply affecting, sustained soprano sobbing, a lament for a good mother seen as bad through white eyes. Wave lines ripple across the space, a ghostly representation of a river since lost to drought. The final scene, the work’s most alarming, serenely tells of an Aboriginal serial killer who strangles and cuts the throats of his people. He is pursued by the hated police who inadvertently take another man in his stead; but then find the killer when they hear his dog barking. Killed, his spirit passes into the dog, to the delight of the tellers who admit that, although he betrayed his people, he was a great man, born with the knowledge of a hunter. The singers sit, affectionately stroking the imagined dog as light fades. The Spirit of Things: The Sound of Objects is a fascinating concert-theatre hybrid, performed with great ease by Nardi Simpson and Kaleena Briggs and, in monologues, with controlled emotional intensity (director Felix Cross). Design (Lucy Simpson), lighting (Fausto Brusamolino) and projections (Mic Gruchy) effectively transform the performance space, making it intimate and local and opening it out to a cosmological vision of the mutability of life, acquainting us with ghosts and the ever-present dead. For the work to entirely succeed we need to hear the songs clearly and be certain which object triggers which story. Hungry for understanding, I long to hear the Stiff Gins speak about what this bracing work’s dark tales mean to them.